The monastery dedicated to Kyufoki, the Fortune of Earthquakes, can be found within one of the many small valleys of the Fallen Mountains. Surrounded by mines, both active and abandoned, the monks can trace the history of the monastery back to the early days of the empire and the discovery of rich iron deposits in the local region. Some tales suggest that the monastery itself sits upon the site of the first mine though the monks deny knowledge of any tunnels within its grounds. While dedicated to Kyufoki the mine is known more commonly referred to as the Thunder Monastery by the peasants of the region due to the constant booming emanating from the many forges. The construction of the forges is a recent development in the long history of the monastery, stemming from the arrival of the monk Komatsu. Hailing from the Oriole Clan the master swordsmith was unable to completely forgo his former life and saw instead the opportunity to serve the celestial order by providing simpler items for the peasant classes. 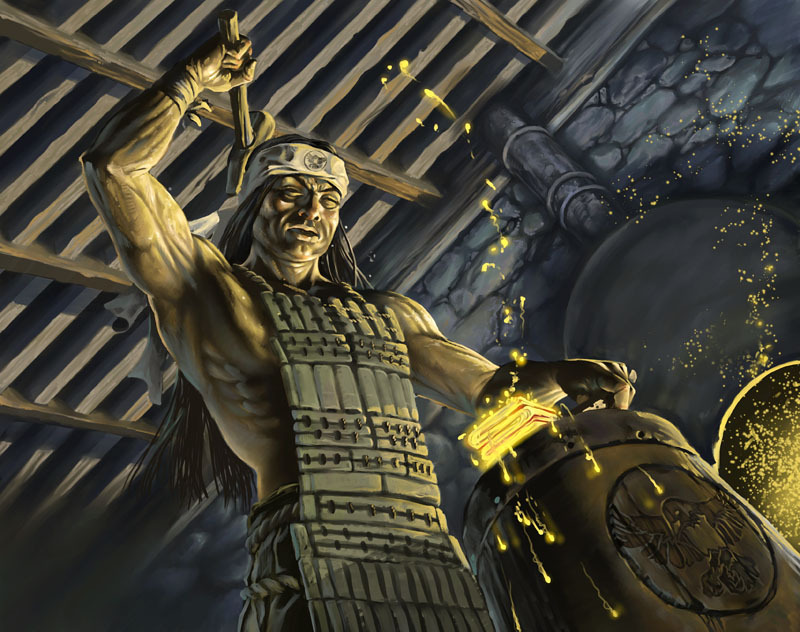 During difficult times the monastery puts its expertise to the production of farm implements, mining tools and other basic items, believing it is their spiritual duty to ensure the lower citizens of Rokugan are able to properly fulfill their role in the celestial order. Outside of these periods the forges are used primarily for the production of temple bells, amulets and other items of spiritual significance. Much of the production is undertaken by peasant apprentices who dedicate themselves to the Order for at least a year, exchanging their service for the opportunity to learn the art of blacksmithing. While many samurai approach the monks and request training in the art of sword smithing most find themselves turned away, not from an absence of skill but because their piety is found lacking by those who have have dedicated their lives to the Fortune. The original form of Kyufoki no Shinden comprised of a modest, low roofed wooden temple dedicated to the worship of its patron Fortune. A small antechamber offering respite from the harsh mountain winds leads directly into the worship hall of the main temple, which is lit by a large central brazier. As the Fallen Mountains themselves form the object of the monks worship the entire back wall of the hall is often removed during the summer months, providing an unparalleled view of the main peaks. To either side of the main temple lie two long, narrow buildings. The older and simpler of the two, nestled up against the side of the valley, is where the monks live, sleep and meditate. The second, open on one side, is lined with the forges and workshops of the temple with the heat from the forges ensuring that even during the winter the temperature never drops too low. It is here that the apprentices learn their trade, breaking from their work only to contemplate their position within the celestial order. In the month leading up to the first harvest of the year the apprentices gather together to give thanks to Kyufoki before they begin their return to their villages in order to share the knowledge they have earned. Often they will be accompanied by some of the monks who will travel the region in order to give thanks at temples and shrines dedicated to other Kami and Fortunes. A master craftsman of the Oriole Clan before his retirement Komatsu has risen to lead the Order over a period of almost 30 years. Age and a lifetime spent in service of the forges have taken a heavy toll upon his body and few would believe the frail elder was once a proud samurai who frequently boasted of being the greatest swordsmith of the era. Instead visitors find a quiet soul of seemingly endless patience, unwilling to raise his voice even in the presence of the thundering workshops that have framed his entire life. Komatsu wishes for little beyond the prosperity of the temple and is content to continue along the path he chose when entering the order. He has chosen to distance the temple from the politics of the Fallen Mountains and maintains only a token contact with Shirayama Toshi to the north, aware that the monks cannot afford to be seen as anything other than impartial by those that have repeatedly fought for control of the region. Should conflict return to the mountains however he fears that both the apprentices and the forges may become a target of the Unicorn or Lion Clans. Aware of this potential Komatsu has built close relations with the Dragon Clan to the south who he feels have earned the respect of the Brotherhood of Shinsei over the years. 1. Terror from the dark – Evil has awoken within the abandoned tunnels under the monastery and people have begun disappearing while traveling in the region. The monks have reluctantly sought out the aid of a group of traveling samurai, knowing that doing so risks exposing the true origins of the temple. 2. Beauty of the Blade – A prominent courtier seeks a gift worthy of an Imperial delegate and, knowing of Komatsu’s earlier life, enlists the PCs to petition him to create a flawless sword. Secretly she also arranges for the assassination of Komatsu so that she can present the gift as the final work of the master blacksmith. 3. Burning Faith – Kyufuki no Shinden has been burnt to the ground by a samurai who claims the monks were practising maho. The PCs must investigate and uncover the truth. An expanded adventure outline based upon this plot hook will be published shortly. Excellent work. Lots of good material here for an L5R campaign. Cheers, my eventual aim is to put together enough material that somebody could use the region as the basis for their own campaign yet still end up with something totally different from the one that has inspired the material. Well, if it is all as good as this it should be easily usable. I may borrow some of it when I return to my L5R campaign.